With the manga series beginning in 1997, One Piece has seen its fair share of adaptations across its 20+ year history, including the still-airing anime series, as well as multiple films and video games. One Piece: World Seeker is the first mainline One Piece game to hit the west in over three years, with the last being One Piece: Burning Blood. Instead of following suit with another fighting game though, developer Ganbarion has been brought in to produce an open-world action adventure title, with their eyes set on capturing not only fans of the series but newcomers as well. 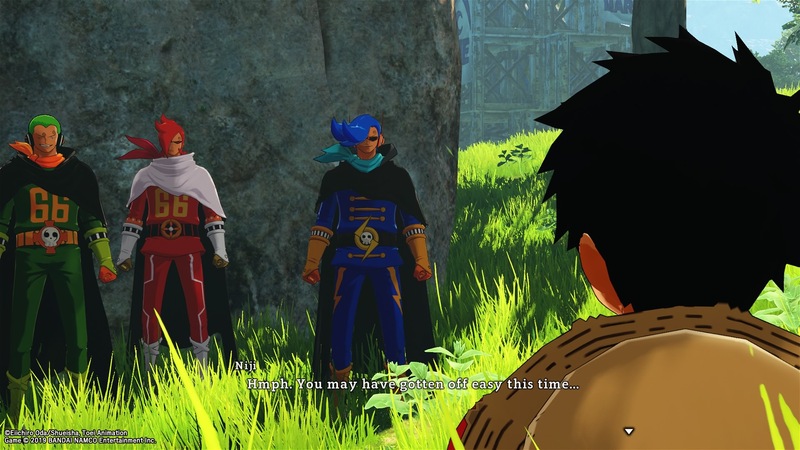 World Seeker puts you in the sandals of Luffy, fearless leader of The Straw Hat Pirates, as he escapes capture and lands on Prison Island. There, he finds himself in the middle of a decade-long feud between Navy forces and a resistance group known as the Anti-Navy. Luffy, as carefree and open-minded as ever, decides to find all of his crewmates from across the island and help the Anti-Navy forces fight back against those imposing on them. 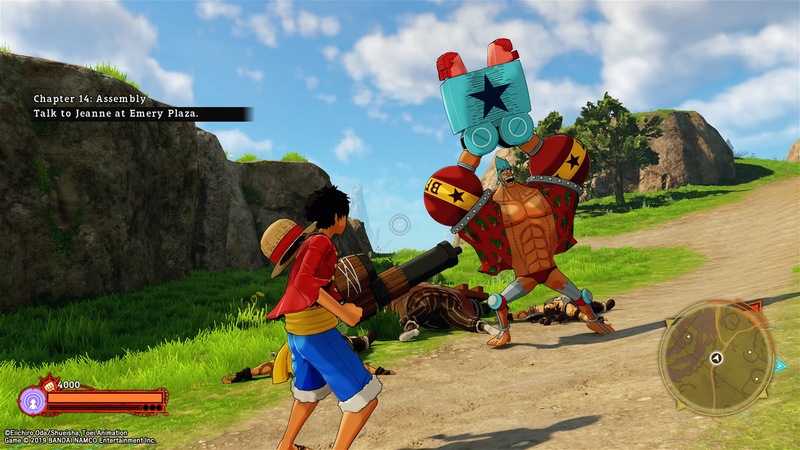 One Piece writer Eiichiro Oda has created an original story for World Seeker that feels right at home in this world of pirates and treasure. As such, it should be no surprise that the story has a satisfying amount of detail and engagement, not only through main story missions but also the plentiful amount of side missions available. While the main story focuses on the leaders of the Navy and Anti-Navy groups (Isaac and Jeanne respectively) and their conflict, the wider world and history of the island and the events that have transpired over the years can be learned through talking with NPCs and completing side objectives. Though most of the side quests you receive can become a bit repetitive (things like fetch quests or taking down small group of enemies), the story and skill points you earn balance out the time spent for the most part. Speaking of skill points, they’re useful for a generous amount of unlockable abilities as part of a skill tree. You have the ability to not only upgrade your combat abilities, but also your traversal and special abilities. The number of skill points gained per story or side mission is normally enough that you can consistently work towards meaningful upgrades, allowing you to focus more on the game’s main story and not get lost grinding for hours. The one thing that does feel out of place is the crafting system. Across the map there are many shiny collectable materials to be found, each with varying levels of rarity and used to craft equipment that helps boost your stats in different ways. Not only is finding materials seemingly random for the most part, but you also need to travel back to your ship to get one of your crew members to craft the equipment for you. Moving across the map is super addictive thanks to the fun traversal mechanics at your disposal. However, if that’s not tour cup of tea there is a fast travel system that will allow to travel between key points on the map. Luffy uses his rubber-like body (a power he gained from eating the Gum-Gum Fruit) to essentially zipline himself around the environment. From treetops to hanging neon signs, you can cover distances much faster by flinging your extendable appendages around. Couple this with an upgradeable glide ability and you’ve got an experience not unlike Insomniac’s recent Spider-Man game with its web-zipping (even if there aren’t as many anchor points across the map in One Piece). Combat comes in two different styles: Observation Haki (fast and accurate flurry-style attacks) and Armament Haki (heavy, hard hitting attacks with larger movement arcs). Pressing down on the d-pad allows you to switch between the two styles on the fly, letting you decide how you tackle each fight. Each style has positives and negatives, with Armament Haki giving you a significant damage boost at the expense of the increased mobility that you have when using Observation Haki, though that style in turn leaves you more open to taking damage. As you fight you build up a ‘tension’ gauge that can be used to trigger special abilities which cause larger amounts of damage. The tension gauge will also empty itself after a certain amount of time without attacking, encouraging you to always be on the move and engaging with the enemy. Adding to all of this, World Seeker employs a karma system for most of the main cast and some of the factions you encounter across Prison Island. Essentially, you’ll have a checklist of particular side missions, combat milestones and other in-game achievements that you need to complete for each character to raise their karma level (how much they like you). Some characters will change the way they speak to you based on this, giving you some sense of action-and-reaction in the smaller events throughout the game. Ganbarion’s attention to detail when bringing the world of One Piece to life, with the visual identity that the manga and anime have built an empire upon, is noteworthy. The use of 3D cell-shaded models does well to bring the characters to life and makes for some very well-directed and exciting in-engine cutscenes. These cutscenes are also helped along by the fantastic voice-over work from the anime’s original cast, with performances on par with that of the show. 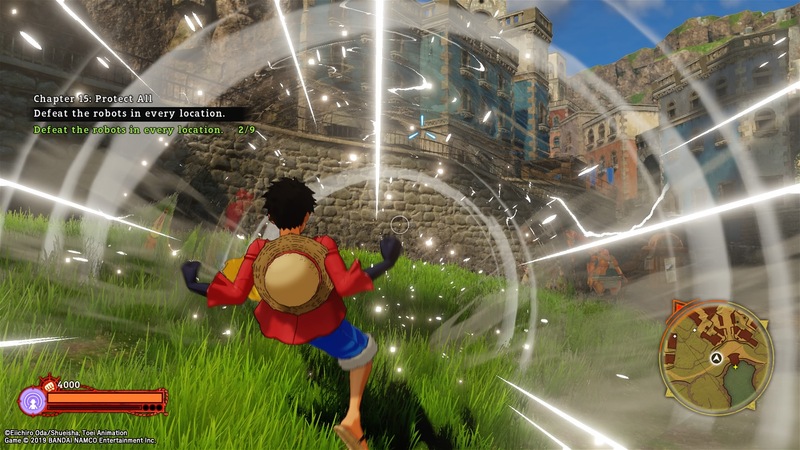 One Piece: World Seeker doesn’t attempt to re-imagine open world action games, and that’s fine. Instead, what you get are solid fundamentals of gameplay that don’t over-complicate themselves and a story that is interesting and entertaining – not just for those invested in the existing series but also anyone looking for some light entertainment outside of the big AAA releases.